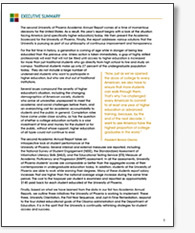 In acknowledgement of the need to produce greater accountability and transparency throughout higher education, University of Phoenix has published our second Academic Annual Report. The Report demonstrates the University’s continued progress in addressing the challenges facing higher education today and calling for greater understanding of the country’s next generation of students, who are increasingly different from generations past. Recognizing the Obama administration’s ambitious goals to address the nation’s educated workforce shortage and the economic crisis, the Report explores how best to serve the growing contingent of talented, hardworking people who want to better themselves, but find they are shut out of higher education because of their real-life responsibilities—a group that comprises 73 percent of college students today. These nontraditional students represent the next generation of learners. They are not just our students, they are America’s students. Understanding their needs and motivations and what systems will be necessary to serve them is critical if we, as a nation, are to produce the highest proportion of college graduates in the world by 2020. University of Phoenix uses the Measure of Academic Proficiency and Progress (MAPP) assessment developed by the Educational Testing Service (ETS) to help measure students’ academic proficiency and progress. The MAPP assessment found that, as a group, the University’s seniors score at comparable levels—with no significant difference—to students at other institutions in the areas of general education. Importantly, University of Phoenix students, who enter under an open-admissions policy at the undergraduate level, often start out with lower test scores in the general education areas, but are able to make gains comparable to students at other institutions upon their graduation. Using the Standardized Assessment of Information Literacy Skills (SAILS) methodology, University of Phoenix freshmen score as well or better in all but two of the eight areas measured as incoming students at other master’s institutions offering at least baccalaureate through graduate level programs. The same is true of the University’s seniors, who compare favorably to students at similar institutions in all but two areas measured. Importantly, University of Phoenix seniors score better than its freshman in each of the literacy competencies measured. The percentage of improvement for the University’s freshmen and seniors is comparable to that of the improvement for like groups in the national survey. While University of Phoenix’s degree completion rate is assessed by the federal government’s Integrated Postsecondary Education Data System (IPEDS), as is every other accredited educational institution, the system does a poor job of capturing the nation’s next generation learners, who comprise the majority of the University’s student body. IPEDS counts only those students who complete their entire degree program exclusively at one institution—without transferring any credit from another institution—and graduate within 150 percent of the normal completion time. Generally speaking, these conditions exclude most students who do not go directly from high school to college as well as those who work full time. According to the American Federation of Teachers, “students still enrolled after 150 percent of expected graduation time represent a growing trend in higher education.” As such, the number of students who qualify for inclusion in IPEDS decreases each year, particularly in the current economy, where more students cannot afford to continue their educations uninterrupted. University of Phoenix’s completion rates for associate degrees is 26 percent for those students graduating in three years and 31 percent for students who take more than three years to complete. For bachelor’s degrees, the University’s completion rate is 36 percent for those students who graduate in six years and 39 percent for students who take more than six years to complete. At the graduate level, University of Phoenix’s completion rate is 55 percent for students who graduate in three years and 63 percent for students who require more than 3 years to complete. Many University of Phoenix students are employed full time while enrolled. As a result, the University’s students do not forfeit wages during the time they are earning their degrees and, in fact, many experience wage increases that are above the national average salary increase for the same time period. Students enrolled in University of Phoenix’s bachelor’s degree programs in 2008 earned an average annual salary increase of 8.5 percent compared to the 2008 national average of 3.8 percent. At the master’s level during the same time period, enrolled students earned an average annual salary increase of 9.7 percent compared to a 2008 national average of 3.8 percent. In addition, an analysis of public costs for higher education conducted by University of Phoenix demonstrated that the University costs taxpayers substantially less than public and non-profit institutions. University of Phoenix’s student body is more diverse than those found at traditional universities. Thirty percent of the University’s students are African American, compared to a national average of 13 percent. Additionally, females make up 67 percent of undergraduate student enrollment at University of Phoenix, compared to 57 percent nationally. Student satisfaction, while not an academic measure, provides insight into how best holistically to meet the needs of this new majority population. University of Phoenix student satisfaction surveys over the last year showed that students rate all categories well above average, ranging from 91-96 percent satisfied. The University also uses an external measure of student satisfaction, the National Survey of Student Engagement (NSSE). In each of the ten relevant categories polled, students rate the support and instruction at University of Phoenix higher than the national average response rating, with the highest rating going for institutional contribution to their knowledge in the area of “thinking critically and analytically."